When we talk of butter, it's generally dairy butter. Nut and seed butters, though commonly used in the West, are yet to conquer the taste of the Indian palate. When nuts or seeds are ground into a paste, they are referred to as butters. These butters are rich in protein, fiber, and essential fatty acids. They are normally used as an alternatives to dairy butter or margarine and are eaten with bread or toast. 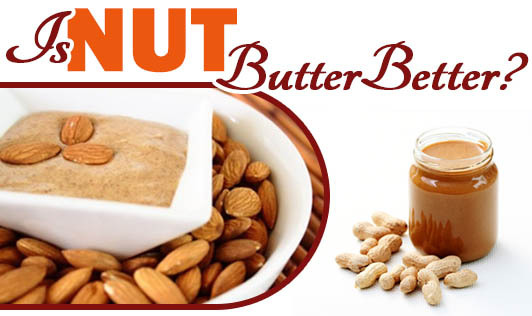 Some of the nut butters can also be thinned and used in soups or as dips and sauces. Commercial peanut butters may contain hydrogenated oil and additives but the natural ones are much healthier and are made purely from peanuts. Sesame seed butter (also called tahini) is also high in, protein and used in Middle Eastern recipes. Dry roast and crush the peanuts in a coffee grinder, that's all! Add a teaspoon of peanut oil when you start the process, but after the process starts, the oil from the peanuts acts as lubricant for crushing. You needn't add any salt, sugar, or additives to extend the shelf life. Nutritionally, one tablespoon of nut or seed butter has about 80 to 100 calories and 2.5 to 4 g of protein. Nut and seed butters have 7 to 10 g of fat in a tablespoon, mostly of the unsaturated kind. Nut and seed butters are good sources of many other nutrients, including zinc, Vitamin E, folic acid, copper, and potassium as well. Most of these nutrients are not present in dairy butter. Another advantage over dairy butter is that nut and seed butters do not contain cholesterol. Nuts contain generous amounts of phytochemicals that may be protective against heart disease and cancer. Hence, they make healthy choices when used in small quantities.